First of all, what is Point Cloud Skinner? Point Cloud Skinner is a Python script for Blender and allows you to create a surface from only a cloud of vertices. You can get a complete 3D mesh out of just vertices that have no faces. 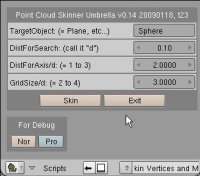 This script, Point Cloud Skinner can skin a cloud of vertices, which means to create a 3D surfaced mesh out of just a cloud of vertices that has no faces. If you want to know how to use quickly, it would be the fastest way to see this video tutorial. It has no sound but will help you know the whole workflow to use the script. This workflow is the same as what you can see in the video tutorial. +1. Download the file "Point_Cloud_Skinner_v0_14_Pub20100110.zip" at here. +2. Unzip it and put the file “t23_PointCloudSkinner1_Umbrella.py” in the folder "%Blender%\.blender\scripts\". Have a point cloud to skin. For example, select "Add >> Mesh >> IcoSphere" from the top menu, set Radius to 1.5 in the menu displayed next and click OK. You will get a sphere mesh. Then press the key Tab to go to Edit Mode and press the key X to display the menu Erase. 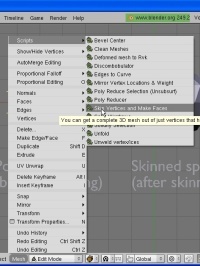 Select Edges & Faces to delete all but vertices. You will get a point cloud of a sphere as the right image. 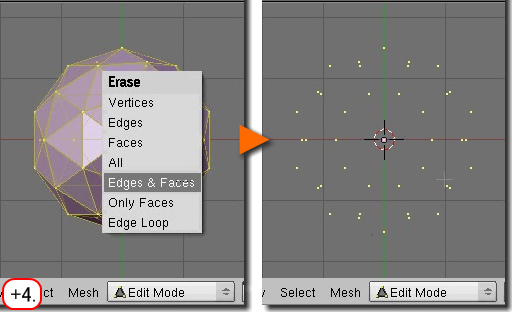 Make sure that you are still in Edit Mode and the vertices are all selected (colored yellow). 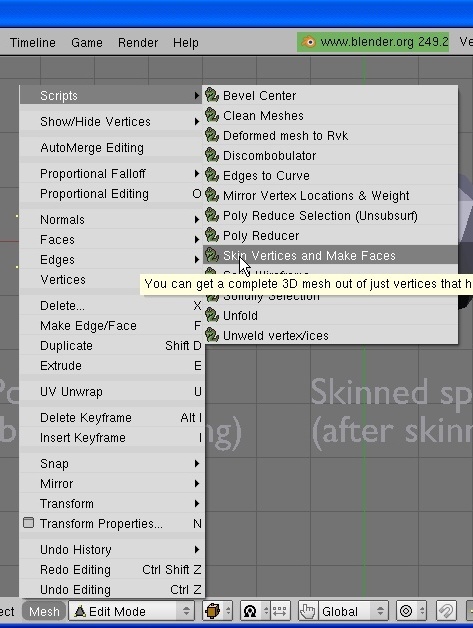 Then select "Mesh >> Script >> Skin Vertices and Make Faces" from the menu. 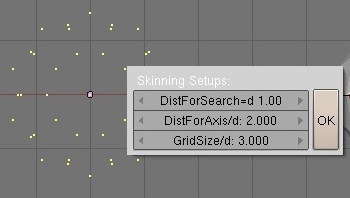 And you will see a dialog window named "Skinning Setups:" like the right image. 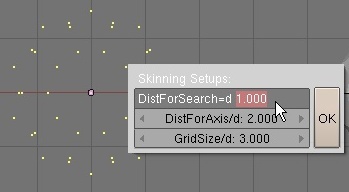 Set the parameters DistForSearch to 1.0 in the dialog for this point cloud. Click the button Skin. The point cloud will get skinned and you will see the same 3D meshed sphere as the original one like the image below. You can also use the script from Scripts Window as follows. Make sure that you have already done the steps +1 and +2 of the previous workflow above and arranged the .py script file to the folder "%Blender%\.blender\scripts\". +2. Split the area and get window two-pane, and change Window Type from 3D View to Scripts Window in the right window. Have a point cloud to skin. For example, a sphere point cloud in the step +3 of the previous workflow above. 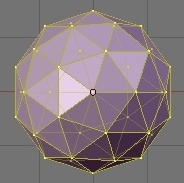 Make sure that the vertices are all selected. 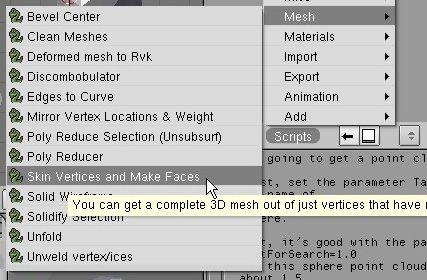 Then select "Scripts >> Mesh >> Skin Vertices and Make Faces" from the menu in Scripts Window. The UI will be seen as the right image. +5. Set the first parameter TargetObject to the Object name that you want to skin, for example "Sphere", which you have created at the step +3. Set the next parameter DistForSearch to 1.0 in this case. If you want to see more about how it works on various point clouds, please check up the following video demos. It will help you know how it works though the previous version of the script is used in the videos. This video shows how the script skins the point clouds of a suzanne, one of the famous pre-defined mesh in Blender. This video shows how the script skins the point clouds of all Clems data, a huge geometry that has around 130,000 vertices. I confirmed Point Cloud Skinner worked well on Blender v2.45-2.49. You can discuss the script on this thread in BlenderArtists. Here is the page where you can find the reason why I made the script, the list of change logs, the future works and more. Here is the page (under construction) which includes some notes or memos while developing the script.